The Piadina is Romagna's most traditional specialty of plain bread, with many different recipes. We propose the piadina recipe of Ravenna. It is a traditional plain bread formerly cooked on a special earthenware slab (as in our photos). Nowadays is also used an iron frying-pan. ATTENTION: the doses are indicative: the quality of the flour, air dampness, the ingredients added to color it, may change the ratio between FLOUR and MILK. Notes to the recipe: Romagna is an area along the Adriatic sea, where are situated the towns of Ravenna and Rimini, ending in the southern part with the mountains at the border with Tuscany. Although it is a small area, we can find many varieties of piadina. In Rimini the dough is thin while in Ravenna thicker, in Cesena has a particular shape and takes the name of "sfogliata". 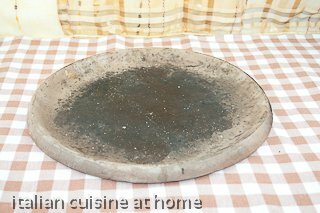 In our photographed recipe, video recipe and here above you can see the traditional earthenware tool for cooking piadina called "testo". With this tool the temperature does not reach a great level, in this manner the product remain softer. Nowadays it is also used a flat iron pan; you can use instead an iron skillet. Follow the instructions of our photographed recipe and you will obtain a good result. Piadina it usually combined with salami, ham, cheese and used instead of the bread. 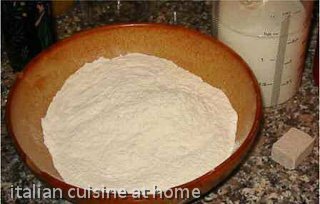 The flour for making piadina is the all purpose flour.